I will confess honestly but sheepishly that I am relieved Easter Sunday is well behind us. Don’t get me wrong here, I love Easter. I even love Lent! But all of the Lenten activities leading up to the big Festival of the Resurrection Sunday service, all the excitement Easter brings….whew! It is a lot! Days off seem few and far between. It’s a little bit like working in retail at Christmas. All this Lent and Easter stuff, soup suppers and Holden Evening Prayer, the emotionally and spiritually moving services during Holy week, the pancake breakfast on Easter Sunday, the great story, the lilies… well… it’s great and all, but did it really make any difference? Ok, so Jesus did all those things. All those really great things. Healing and teaching and all that. Then they killed him. And then he “rose from the dead”. Ok. But did it really make any difference? After all that, after all the work of Easter, is the world really any different? Looks to me like things are back to normal. Looks like we are back to the everyday grind. And really, I’m tired of it. Aren’t we all tired of it? Here in this every day ordinary life, is there anything sacred, mysterious, holy going on? Where is God? 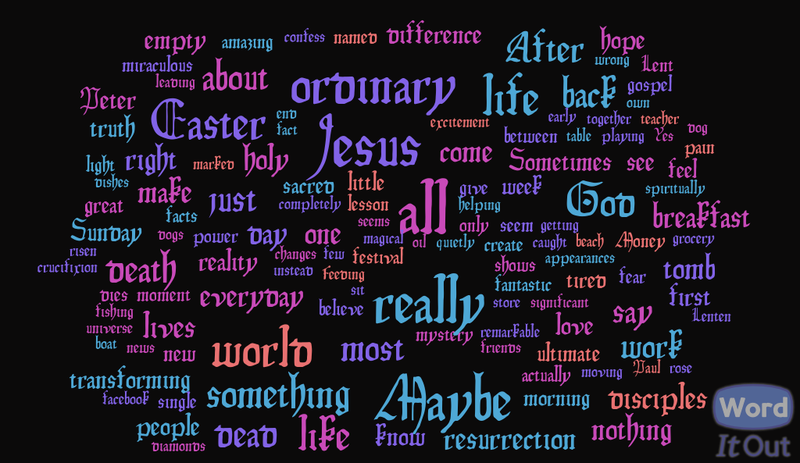 Did all of that Easter business make any real change in the ordinary world? After all the fantastic stories of miracles, life and death struggles, crucifixion, resurrection and magical bodily appearances of the Jesus who is suppose to be dead, today’s Gospel is, let’s face it, a let down. Back to the everyday world. It’s back to the ordinary fisherman’s life for Peter and six of the remaining eleven disciples. Did any of it really change anything? The only remarkable thing about this text is its marked ordinary-ness. The disciples aren’t huddled together in fear, terrified that they may be tortured and put to death for following Jesus like they were last week. And it is certainly true that fear for their lives was a reasonable response to the situation. Our first lesson today tells of Saul, the man we will later come to know as Paul, who spent his entire professional life hunting down the followers of Jesus like dogs and putting them to death. But our gospel lesson has none of that. It also does not show any of them, not a single one, sharing this supposedly stunning good news about the resurrection of Jesus with one single person. In fact, there is only this odd exchange between Jesus and Peter as Jesus asks him to care for his followers and Peter pretty much missing the point. That’s certainly business as usual isn’t it! Yes, today is just a fishing trip. After all that has happened, they do exactly what we do shortly after Easter Sunday. They and we just go back to work. Maybe they were tired, too. Don’t we all feel that way sometimes? Therapists say that there is such a thing as post-holiday blues when we may feel a bit depressed after a big festival or holiday like Christmas or Easter. It’s not uncommon. After any big event that’s suppose to ‘change the world’, we can all feel a little disappointed when it doesn’t seem to have worked. At least, not the way we thought it would. You see, from many people’s perspectives, this Easter business isn’t the ultimate reality. The truth is, there is entirely too much pain and suffering in the world today. It is exhausting when you try to deal with it all. Reality of this life is that death has the last word. It would, therefore be foolish to say that the life and death of that first century Jewish man named Jesus really made any significant difference in how the world works. Why? Because you and I all know that might makes right, power is superior to compassion and, in the end, despair is stronger than hope. So we could just refuse to believe a man could really come back from the dead. Sometimes the most important facts are the hardest to accept, even when you see them right in front of you. Sometimes it seems like, maybe, resurrection is a false hope. Really, how can you say an empty tomb changes everything? Many people might say: don’t you see? God loves the world is a lie because the hard cold truth is that Money is God and the one who dies with the most toys wins. It is quite likely that there is no more to this world than what you can see, hold and buy. Take what you can because that’s all there is. Many simply do not think that God can give life to the dead, bring light from darkness, and create something out of nothing. There is no mystery in everyday life. There is nothing sacred about ordinary things and ordinary people like you and me. What if the testimony of the women at the tomb, that tomb that was supposed to contain the remains of their beloved friend and teacher but was completely empty that morning, is actually true? If it is true, then maybe… just maybe… God can give life to the dead, bring light from darkness and create something from nothing. Maybe there is something sacred about ordinary things and ordinary people, and maybe there really is mystery in everyday life. Maybe Jesus does show up on ordinary work days and not just on the flashy, fancy ones. Maybe Jesus really is there on the beach making breakfast for the disciples and transforming the most ordinary things into something holy. When Jesus calls out to the disciples in their boat: hey boys, you haven’t caught any fish, have you? They do not recognize him. Maybe Jesus is in our lives right now, even in our work day, even when we’re playing on facebook instead of doing work, when we’re in the grocery store or getting the oil changed, even on a lazy and boring afternoon when nothing important could ever happen, wherever we are, calling out to us not just about fantastic and miraculous and amazing things, but about our very own ordinary lives. Maybe Jesus actually cares about our ordinariness and cares enough to show up in the middle of it, helping us out with whatever it is we are doing, even mundane tasks, and transforming them into something new. Maybe Jesus shows up when we wash the dishes, walk the dog, do the laundry, answer email, plan parties. When we sew and knit and watch tv and play with our animals. Maybe even when we run errands or chat with friends or sit quietly with those we love doing absolutely nothing. When we don’t even know it’s him who’s standing right there. When the disciples recognize Jesus, they come ashore and he… and he… doesn’t turn water into wine, doesn’t make diamonds out of sand, doesn’t bring down giant lightning bolts from the sky with his bare hands and doesn’t do anything particularly spectacular at all. Jesus makes them breakfast. Savior of all the universe, of all that is and has been and is to come, making you breakfast. Maybe he was at your breakfast table this morning. Not shining in all his majestic glory that he most certainly could do at any moment if he chose to do so. Bust there, with you, with me. Feeding us. Transforming our lives, one little ordinary moment at a time into something new. Something holy. You know, I think that maybe “the one who dies with the most toys wins” and “Money is God” are the real lie because the truth is that the God who shows up for us day in and day out is a God who really does love the world. The truth is that an empty tomb really does change everything. How could we say Resurrection is a false hope? Sometimes the most important facts are the hardest to accept. But a man can come back from the dead. So we can just refuse to believe that despair is stronger than hope, power is superior to compassion and might makes right. Because the life and death of a first century Jewish man named Jesus really does make a difference and it would be, therefore, foolish to say that death has the last word. There truly is too much suffering and pain in the world today. But for many of us… no, for all of us, for the whole world, this suffering is not the ultimate reality. The ultimate reality is that early in the morning on the first day of the week, the tomb was empty and that through our everyday lives, when we work and play, through the amazing and miraculous things and through the most ordinary things, Jesus, risen from the dead, is there transforming every minute making ordinary things and people into something holy. Making all things new.